I want to thank Diane Anderson for her review in the January issue of Fletcher Wortmann ’09’s book Triggered, about struggling with obsessive-compulsive disorder. She likens the load he carried to the burden of a Fifth Course. 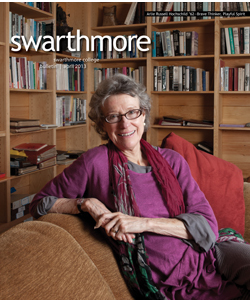 I suffered from obsessive-compulsive disorder when I was at Swarthmore. I had no name for what I was experiencing. I was ashamed of my obsessions. I kept them secret. They were a blight from which no particle of my experience escaped. They were nothing; they were everything. I minimized them, and they grew enormous. I tried to walk around them, and they blocked every path. I lived in Mary Lyon, which was then a boy’s dormitory at the outskirts of the campus. My first roommate was a heavy-set fellow—cheery, neat, and clean. I found him repellent. One evening I noticed a sliding wooden door at the end of a corridor. I pried it open and discovered an abandoned freight elevator. By operating its rope pulleys, I could move it up and down between floors. I brought my bedding and a chair into the elevator and created a hiding place for myself. There was a bare electric bulb in the ceiling. There were no windows. Night was the same as day. I could hear the sounds of people coming and going in the corridors. No one knew I was there. I literally inhabited the woodwork. Even there, I could not escape my obsessions. Anderson and Wortmann do us a great service. They make it easier to come out of the closet (or freight elevator, as the case may be).